Is this a new Range Rover Evoque derivative we don't yet know about? 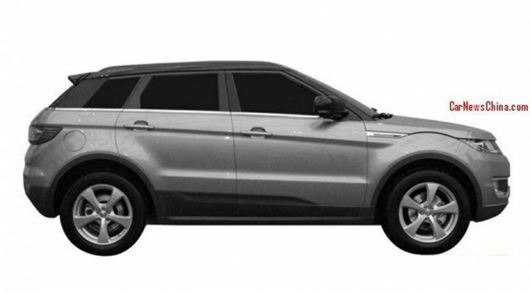 According to the Car News China website, Chinese company Jiangling, using its Land Wind brand, has filed a patent for this new SUV, which hasn't just been influenced by the Range Rover Evoque, but appears to be a blatant copy of it. Land Wind, which isn't a newcomer to this market sector, and is best known in Europe for having sold a facsimile of the Vauxhall Frontera. That car, which was sold in Germany performed disastrously in EuroNCAP tests, and was pulled from the market as a conseqence. The new car, called the E32 is expected to go on sale in China towards the end of 2014. The patent drawings, revealed by China Car News are certainly striking, and there is absolutely no mistaking what car Jiangling is hoping to emulate withe the new E32. But for budget conscious Chinese motorists, the E32 will have one very important quality in its favour - it's expected to be priced at around £11,500 locally. According to the website, the new car will be powered by a 2.0-litre turbocharged four-cylinder petrol engine developing around 190PS and 250nm, mated to a six-speed manual or an eight-speed automatic. It will be interesting to see how Jaguar Land Rover reacts to this interesting new addition to the Chinese car market - because back in 2008, BMW lost its case against Chinese carmaker CEO, which built an SUV that allegedly looked rather too similar to the X5. 'facimile' should be facsimilie, do get a grip, after all, you are supposed to be a journalist. Wrong also - it's "facsimile" !